You see it all over Japan, hand gestures. Not hand gestures like the Italians, mind you. No the Japanese don’t typical gesticulate during conversations. You do, however, see hand gestures by conductors and the drivers of the various train systems. 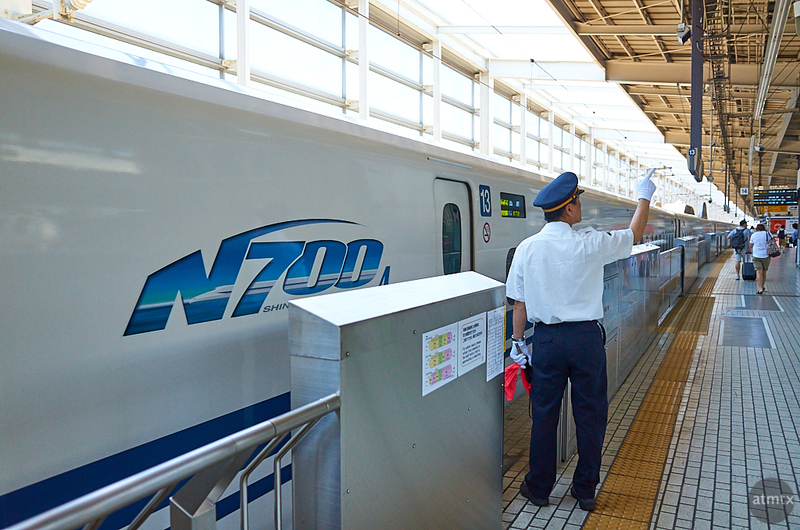 Here you see a conductor at Kyoto Station gesturing on the Shinkansen platform. I read once that incorporating hand gestures makes people remember a process better and they execute it more precisely. Train conductors point at different key displays and make verbal confirmations along with the hand movements. I suppose all of this is part of the quest to have a safe and meticulously on time system. I walked onto Kyoto station a mere two hours after starting from Yokohama, a distance of about 275 miles. It was noticeably hotter, which surprised me. I didn’t expect the weather to be so different over a relatively short distance. It’s more than the weather, however, that’s different between Eastern Japan where Yokohama is versus Western Japan. There’s actually a difference in sub-cultures, foods, accents, and personalities too. I prefer Kansai, Western Japan, centered around Kyoto and Osaka. The people are generally friendlier, the area is less crowded, and the food is fantastic. Yeah, Kyoto is ridiculously warm in summer. That’s a good point about hand gestures; especially when it comes to train conductors, bus drivers, and whatnot, you see them repeating the same gestures over and over, and most of them try to be as precise as possible with them! Thanks your comment and visit, Stefanie. Kyoto is a wonderful city, despite getting hot in the summer.